JEDDAH: The Mesaharati, or public waker, is one of the oldest and most deeply rooted of Ramadan customs. The title is given to a person who voluntarily takes it on himself to wake up Muslims during the holy month to eat the suhoor meal before they start their fasting at the Fajr prayer call at dawn. 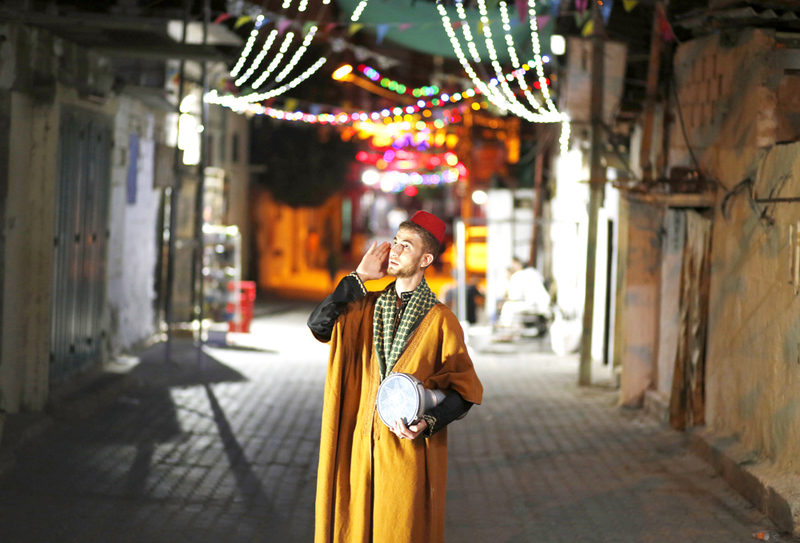 Abdul-Muhsen Doom, the mesaharati in Al-Balads Ramadan Festival, said that the practice was mainly created because people used to go to bed after Taraweeh prayers every night. The Mesaharati's main role was to wake people up for suhoor using his drums while repeating the still-known phrases of “Sabbahak Allah bil ridha wa alnaeem” (May Allah wake you with satisfaction and bliss) and “Ya nayem wahhid Aldayem” (Sleeping, praise the Permanent Allah). The Mesaharati would stand under each house window, calling everyone by name until he heard a response before moving to the next house, Doom said. “During which, the sound of suhoor cannon was the known sign for all misahratiyah (the plural of mesaharati) to start their rounds around each ones neighborhood as every neighborhood used to have its own mesaharati chosen by its own residents,” he said. When Doom was a child, Amm Yahya Galangi was the mesaharati of his Al-Mathloom neighborhood. Malak Baeesa, the omdah, or mayor, in Al-Balad, Old Jeddah city, told Arab News that the Mesaharati is one of the most appreciated Islamic traditions of the month of Ramadan. He said that a mesaharati title is an honor, equivalent to being selected as the omdah, that used to be given by the people of a neighborhood to a well-known person among them. While it had been a popular and actively practiced profession in most Arab countries, the need for a mesaharati gradually declined 40 years ago due to the change in peoples sleeping behaviors, the use of new technologies such as alarm clocks and the development of cities, where it became harder to hear the mesaharatis voice. Yet some people are still volunteering to keep this tradition alive around the Arab world. It is believed that the first mesaharati, or drum holder, was Bilal Bin Rabah, one of the Prophet Muhammads companions. He used to walk the streets and roads throughout the night to wake people up. However, some say the tradition first appeared in Egypt, where the mesaharati used to roam the streets of Cairo holding a small drum and tapping it with a piece of leather or wood. He was often accompanied by a child holding a lamp to light the way and echo his distinctive calls. The mesaharati would call the name of each house owner as he passed by. At the time, the women would wrap a coin in a paper and light it so the mesaharati would be able to find it in the darkness. The tradition is practiced in several Muslim countries including Egypt, Syria, Sudan, Saudi Arabia, Kuwait, Jordan, Lebanon and Palestine. Each of these countries has their own mesaharati traditions and songs or prayers that they chant as they walk the neighborhood to wake the people up. The mesaharati in Syria, for instance, used to have strong connection with his community. People trusted him to deliver food and money to those whom he knew were in need. When Ramadan comes to an end and the celebrations of Eid Al-Fitr start, the mesaharati receives gifts of money and food from people to express gratitude for his services during the month. “Although the mesaharati is considered a voluntary role, people pay him whatever they can once Ramadan comes to an end, as an Eidyah (Eid gift) during Eid Al-Fitr,” Doom said.